Just for ease of use, I wanted to collect all of the new product bundles (and my new book) onto one page so folks can have an easier time finding it. I’ve also got some new Affiliate Opportunities (through Clickbank) described at the bottom of the page. If you hadn’t guessed by the title, those two books are The Rapid Fat Loss Handbook and my Guide to Flexible Dieting. The combination of the two provides a one-two punch to first take off the weight quickly (which research shows that, if done properly, is actually superior to slower approaches) and then keep it off. Of course, Rapid Fat Loss always incorporated Flexible Dieting principles but the information in Rapid Fat Loss was expanded greatly in A Guide to Flexible Dieting. Here are some pretty pictures and more about the products. The Rapid Fat Loss Handbook – This is the core diet and exercise program manual detailing the background diet along with everything you need do know to implement it. 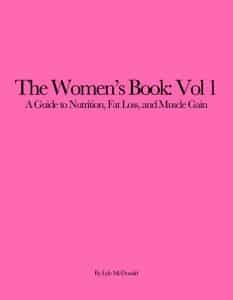 The book is packed with information on general nutrition and fat loss along with complete instructions on how to follow the diet, when to take breaks, how to move to maintenance when the diet is over along with many other topics. An Online Calculator (w/instructional PDF): This calculator will take your current stats and generate a sample diet along with some sample meals automatically. This makes setting up the Rapid Fat Loss diet a breeze. It can also be used to set up the Extreme Rapid Fat Loss approach (described below). The Home Exercise Handbook – Showing you basic exercises that can be done at home with no equipment (at most you’ll need two empty milk jugs filled with water or sand). The book discusses the basics of exercise and gives sample programs along with exercises ranging from beginner to intermediate to advanced. The Home Exercise Handbook Videos – A complete set of videos of the exercises from the Home Exercise Handbook demonstrated by fitness model, personal trainer and good friend Sumi Singh. Every video is first demonstrated and explained and then a full set is shown so that you can simply follow along as you do your workout. A Guide to Flexible Dieting – This is the complete second book I described above and details how the body regulated weight and fat (how and why it fights back) and expands on the information in the main Rapid Fat Loss Handbook to provide you with everything you need to maintain your weight loss in the long-term. This book could be sold by itself but I’m giving it to you for FREE to help ensure that you not only lose the weight but KEEP IT OFF. The Extreme Rapid Fat Loss Manual – A brand new booklet outlining an even more extreme 4-day cycle, based on current cutting edge research, that can strip up to 2.5-3kg (5-6.6 pounds) of fat off in only 4 days. For when even the Rapid Fat Loss handbook won’t get you to your goal fast enough. Along with the two books, you’ll also get access/instructions to an online calculator to set up the Rapid Fat Loss Handbook part of the diet. There is also the Home Exercise Handbook, completely updated with new pictures (of fitness model Sumi Singh) and a brand new new video library demonstrating all of the exercises. Mind you, this is really for beginners to exercise who want a simple home program; folks who are already on programs get specific guidelines in the book. Finally, I’ve actually produced a new little booklet with the incredibly creative title The Extreme Rapid Fat Loss Diet Manual. Based on a study I reviewed on the site, this will show you how to combine diet with exercise to lose up to 6 pounds of fat in only four days (that’s not a typo). When you buy the package (and I didn’t say IF because we know you’re buying it), you’ll get sent to a login page to set up a membership login to get the files. You can view them on the site or download them but keep your password and login and you can always get to your content without having to email me. It’s your personal members area so you can get to the files as needed. Please note that some folks aren’t getting taken to the registration page, it seems to be related to mobile phones and a certain browser type but I can’t pin it down. If you purchase this package and don’t get to the registration page, email me and I’ll fix it. If you bought both e-books alone, it would be $60. If you bought them at the same time on my site, the two-book $10 discount would make them $50. But since I know the power of a sale, I’m making this $47. I hear that 7 is the new 9 so there ya’ have it. And that’s it, no muss, no fuss, no tricks. $47 today, tomorrow or next week. You get both books, the home exercise handbook and video library, the new little extreme fat loss manual and access to a member’s area so that you can always get to your files. The Ultimate Diet 2.0 is one of my earlier books, a cyclical diet (ala the original Bodyopus program) that allows folks to lose fat while maintaining or even gaining muscle mass. It’s been used for years by people to achieve what are often thought of as contradictory goals. If the UD2 has a drawback it’s that, to make it work, it has to be followed exactly in terms of the diet and training structure. The Stubborn Fat Solution is newer and while it shares many concepts with my Ultimate Diet 2.0, it’s a distinct approach. In it you’ll learn everything you need to know about the whys and wherefores of stubborn fat, including how to get rid of it. Four distinct training protocols, along with dietary and supplement recommendations are provided and Stubborn Fat is much more flexible than the Ultimate Diet 2.0; that is it can be used with whatever diet and training approach you’re on. But since I would never be content with just repackaging two of my old books (which you can just as easily buy together on my site), I’ve written a little addendum to the original Ultimate Diet 2.0 (Stubborn Fat is perfect as it is). In it I detail a 2-week break-in cycle, what to do during breaks between cycles as well as how to end the diet (To avoid ballooning up) and I give specific training and diet advice. I’ve also given more details about how to use the Ultimate Diet 2.0 for powerlifting and Olympic lifting goals. Finally, I’ve gotten around to writing out the 14-day UD2 cycle that people have talked about but that I never really detailed. For the record I will NOT be making the UD2 Addendum available for individual sale UNLESS you have previously purchased the Ultimate Diet 2.0 itself. Simply contact me at orders@bodyrecomposition.com and send me your previous purchase receipt (or the email you used to buy it) and I can send you a purchase link individually. The full package, both books and the addendum is $47.